2/2 way solenoid valves. The valve is actuated by a solenoid and opens in a fraction of a second. A solenoid valve is an electromechanical controlled valve. The valve features a solenoid, which is an electric coil with a movable ferromagnetic core in its centre. This core is called the plunger. In rest position, the plunger closes off a small orifice. An electric current through the coil creates a magnetic field. The magnetic field exerts a force on the plunger. As a result, the plunger is pulled toward the centre of the coil so that the orifice opens. This is the basic principle that is used to open and close solenoid valves. "A solenoid valve is an electromechanical actuated valve to control the flow of liquids and gases." Solenoid valves are amongst the most used components in gas and liquid circuits. The number of applications is almost endless. Some examples of the use of solenoid valves include heating systems, compressed air technology, industrial automation, swimming pools, sprinkler systems, washing machines, dental equipment, car wash systems and irrigation systems. 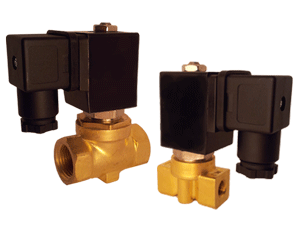 Solenoid valves are used to close, dose, distribute or mix the flow of gas or liquid in a pipe. 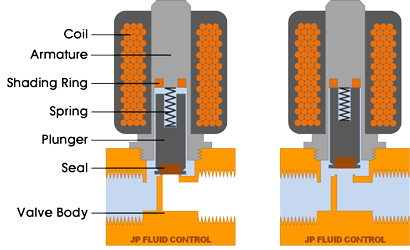 The specific purpose of a solenoid valve is expressed by its circuit function. A 2/2 way valve has two ports (inlet and outlet) and two positions (open or closed). A 2/2 way valve can be 'normally closed' (closed in de-energized state) or 'normally open' (open in de-energized state). A 3/2 way valve has three ports and two positions and can therefore switch between two circuits. 3/2 way valves can have different functions such as normally closed, normally open, diverting or universal. More ports or combinations of valves in a single construction are possible. The circuit function can be expressed in a symbol. Below are some examples of the most common circuit functions. The circuit function of a valve is symbolized in two rectangular boxes for the de-energized state (right side, visualized by ) and energized state (left). The arrows in the box show the flow direction between the valve ports. The examples show a 2/2-way Normally Open (NO) valve, a 2/2-way Normally Closed (NC) valve and a 3/2-way Normally Closed valve. For more information about valve symbols and circuit functions, please visit the page about valve symbols. 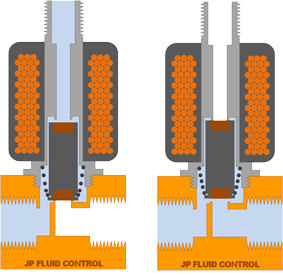 Direct operated (direct acting) solenoid valves have the most simple working principle. The medium flows through a small orifice which can be closed off by a plunger with a rubber gasket on the bottom. A small spring holds the plunger down to close the valve. The plunger is made of a ferromagnetic material. An electric coil is positioned around the plunger. As soon as the coil is electrical energized, a magnetic field is created which pulls the plunger up towards the centre of the coil. This opens the orifice so that the medium can flow through. This is called a Normally Closed (NC) valve. A Normally Open (NO) valve works the opposite way: it has a different construction so that the orifice is open when the solenoid is not powered. When the solenoid is actuated, the orifice will be closed. The maximum operating pressure and the flow rate are directly related to the orifice diameter and the magnetic force of the solenoid valve. This principle is therefore used for relatively small flow rates. Direct operated solenoid valves require no minimum operating pressure or pressure difference, so they can be used from 0 bar up to the maximum allowable pressure. The displayed solenoid valve is a direct operated, normally closed 2/2 way valve. Schematical representation of a direct operated solenoid valve (2/2-way, normally closed). The short video below explains step by step the operating principle of direct operating solenoid valves. For the example a 2/2-way normally closed valve is used. Although direct operating solenoid valves exist in many forms, the basic working principle is always the same. The video explains step by step how a direct acting solenoid valve opens and closes. If you like the video, you are free to subscribe to our channel or share the video. 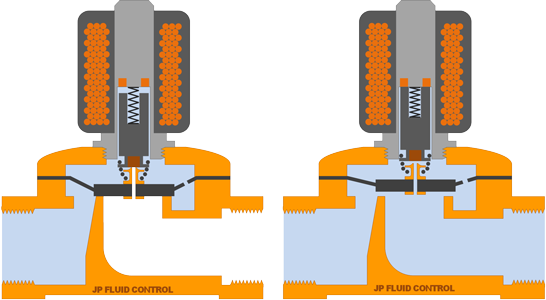 Indirect operated solenoid valves (also called servo operated, or pilot operated) use the differential pressure of the medium over the valve ports to open and close. Usually these valves need a minimum pressure differential of around 0.5 bar. The inlet and outlet are separated by a rubber membrane, also called diaphragm. The membrane has a small hole so that the medium can flow to the upper compartment. The pressure and supporting spring above the membrane will ensure that the valve remains closed. The chamber above the membrane is connected by a small channel to the low pressure port. This connection is blocked in the closed position by a solenoid. The diameter of this "pilot" orifice is larger than the diameter of the hole in the membrane. When the solenoid is energized, the pilot orifice is opened, which causes the pressure above the membrane to drop. Because of the pressure difference on both sides of the membrane, the membrane will be lifted and the medium can flow from inlet port to outlet port. The extra pressure chamber above the membrane acts like an amplifier, so with a small solenoid still a large flow rate can be controlled. Indirect solenoid valves can be used only for one flow direction. Indirect operated solenoid valves are used in applications with a sufficient pressure differential and a high desired flow rate, such as for example irrigation systems, showers or car wash systems. Indirect valves are also known as servo controlled valves. Schematical representation of an indirect operated solenoid valve (2/2-way, normally closed). The video below explains step by step the operating principle of indirect operating solenoid valves. For the example a 2/2-way normally closed valve is used. The video explains step by step how an indirect acting solenoid valve opens and closes. If you like the video, you are free to subscribe to our channel or share the video. Schematical representation of a semi-direct operated solenoid valve (2/2-way, normally closed). The short video below explains step by step the operating principle of semi-direct operating solenoid valves. For the example a 2/2-way normally closed valve is used. The video explains step by step how a semi-direct acting solenoid valve opens and closes. If you like the video, you are free to subscribe to our channel or share the video. A 3/2 way solenoid valve has three ports and two switching states. 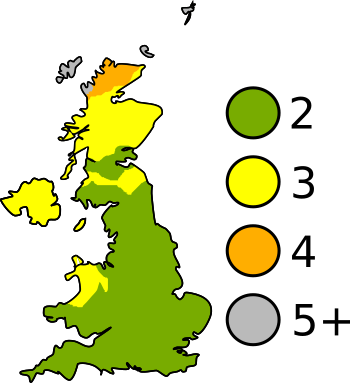 In each switching state, two of the three ports are connected. 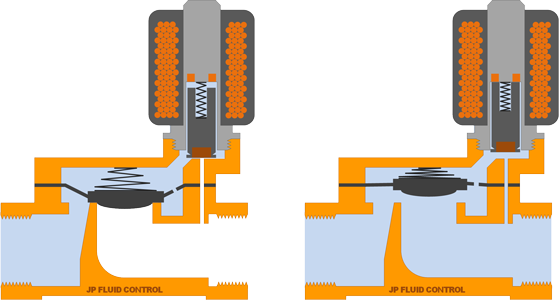 By activating the solenoid, the valve switches state and a different connection between the valve ports is established. The drawing below shows a direct operated 3/2 way valve. The port on the left side is the input port (P). In the de-energized state, the medium can flow from the port on the left side to the top port (exhaust port). In the energized state, the medium can flow from the right port to the left port. This is a called a normally closed 3/2-way valve. Schematical representation of a direct operated 3/2 way solenoid valve.